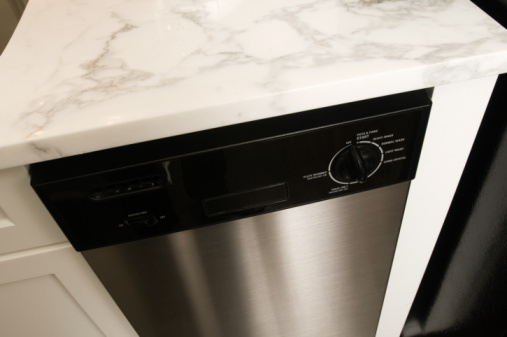 Whirlpool is a reputable appliance manufacturer, but even the best dishwasher can have an occasional problem. Most issues that occur with the Silent Partner 1 are the result of user error and are easy to fix. Before you attempt extensive repairs yourself, know the status of your warranty. Certain parts of the machine carry a full 20-year warranty that could be automatically voided by unauthorized repairs, so contact a repair center if you have any doubt. Check your fuses/circuit breakers to make sure they are fully functional. Replace any that are blown. Make sure the dishwasher is securely closed and plugged in. If it does not close securely, replace the door latch, located beneath the control panel. If it still doesn't work, unplug the dishwasher and pull it out from under the counter until the wiring is exposed. Follow the wiring that runs from the house to the dishwasher. If it is burnt, replace it. If the wiring is fine, replace the timer and selection switch, both located under the control panel. Remove the silverware basket and door liner for easy access. Consult your owner's manual for the proper loading technique. Improper loading is the number one cause of bad cleaning. Be sure to put detergent in both cups and use a rinse-aid solution in the designated receptacle. If you keep the silverware basket in the bottom rack, try installing it in the designated holder on the door. This may allow more water to circulate, and will make the rack less crowded. Increase the water temperature on your water heater. For safety's sake, do not set it above 120 degrees Fahrenheit. Remove the bottom rack and locate the drain filter. Manually remove any debris or clogs. Inspect the spray arms to make sure the holes are not clogged. Use a toothpick to clear debris. Locate the float switch near the bottom of the inside of the tub. Make sure it can move easily. If it cannot, or if it is broken, replace it. Locate the drain valve, where the drain hose attaches to the machine. Remove the hose and check the valve for clogs. Remove clogs manually. Check all seals and gaskets for signs of wear or cracking. Replace as necessary. The Silent Partner 1's main seal—the one around the opening of the tub—is usually the first to wear out. This can cause water to leak out the front. Unplug the dishwasher and inspect all water lines, both inlet and drain, for kinks, holes, cracks or loose connections. Replace or tighten as necessary. Do not leave excess hose length inside the machine because it may touch the heating element, which will melt a hole in the hose and cause a leak. This is a common problem with Silent Partner 1 dishwashers. Check the valves where the hoses attach. If they are loose, replace the entire valve. If the machine still leaks, contact a repair center. Inspect all belts for signs of wear, including fraying, cracking or breaking and replace as necessary. If the motor hums but does not turn, replace it. If your dishwasher still retains water, replace the pump.